So Clinton and McCain won in New Hampshire. All the polls got it wrong. Great upset story. This morning, I wanted to read about how it happened, but I only had time to read one article before getting to work. This presented an interesting question. How should I figure out who’s got the best coverage of the New Hampshire primary results, which is being covered by every news outlet and political blog on the planet? I could got to any mainstream media site, and read the headline article. But which one would be worth my time? Who’s got the inside dope? There were a gazillion journalists in New Hampshire last night — which one should I listen to? You would think in the age of search and news aggregators, it would be easy to find out. Well, there’s the obvious CNN story — didn’t need Digg to find that. And there’s a story about Clinton supporters being desperate, which seems less likely now. 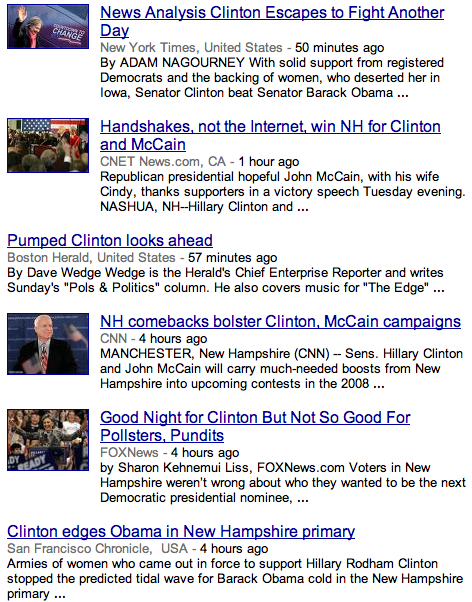 But not much selection of New Hampshire coverage. If you look at the time stamps, there hasn’t been much of a flow of stories since last night. Again, two predictable CNN stories. Not much help here. CNN again. Some stories about Giuliani in NH. Some potentially interesting stories outside New Hampshire. But not what I was looking for. I did find on Digg the story about CBSNews.com’s partnership with Digg — some interesting discussion in the comments. 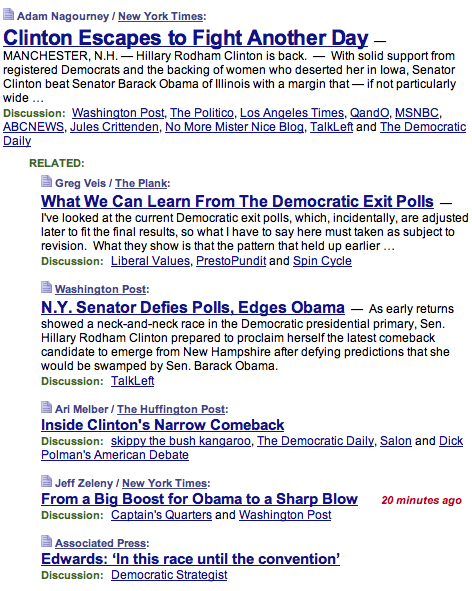 Moving on, I went to Google News, thinking surely Google won’t let me down. 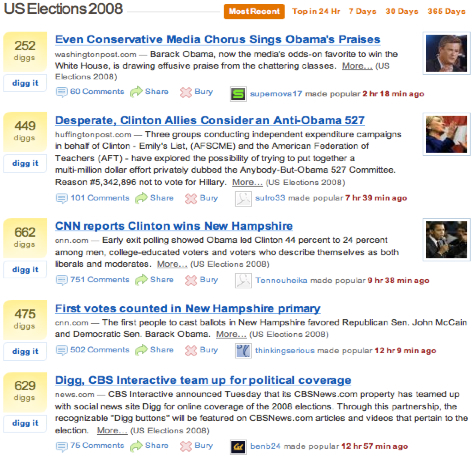 And sure enough, the New Hampshire primary was the top story. One of these 6828 articles must be worth reading. But which one? It’s a fantastic range of sources — but it goes on, and on, and on, and ON for pages. Google is nothing if not exhaustive. Should I just read the top story? Would that be the best one? 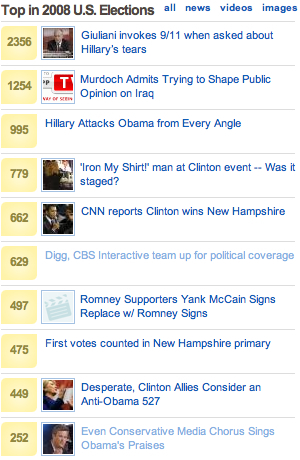 It would have be be great to have Digg-style vote rankings, but with the same breadth of options — but it’s not at all clear how Google News’ laundry list is being ranked. One thing I did note on the first page was that there was nothing from any New Hampshire Newspapers, like the Union Leader or the Nashua Telegraph — you would think they might have some insights into what happened. But predictably they got drowned out by all the national sources. OK, now we’re talking. Unlike Digg, this was exactly what I wanted in terms of focus. And it was a more manageable list than what I found on Google News. It also included blogs along with traditional sources. So is the New York Times the best read, as Google News also suggested? Or one of the blogs? 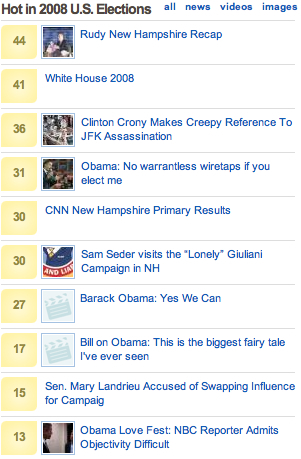 I ended up checking out more stories than I really had time for, as I often do with big TechMeme pile ups. Notably, again, there was no coverage from local sources. And no unexpected sources, or hidden gems, as you might find on Digg. Still, it seems Memeorandum did the best job in focusing my reading on the New Hampshire Primary, using the methodology of counting top blogger links as votes. Of course, I could have just gone to the New York Times, as I typically do to check headlines, and gotten the piece same piece I found on Memeorandum and Google News. But then where would I have gone from there if I wanted to read one more take? Or two more takes? Oh, well, too bad there’s not a Memeorandum with Google News’ breath of topics and sources and Digg’s vote count ranking and discovery of hidden gems. Do Youth Media Habits Predict The Future Of Media?